The only thing I really wanted to do on my birthday in late July was to work. It was stinkin’ hot and humid out, 98 degrees. I wound up shooting photos out the studio windows all day, getting a lot done at the desk and having a ball too. You'll remember the birthday post, the way the gifts kept coming! Nasty as the day had been, I knew that the evening would be magical, as the creatures came out from their shaded haunts to feed. That's how it works. The nastier and hotter the day, the more delicious is the evening time. 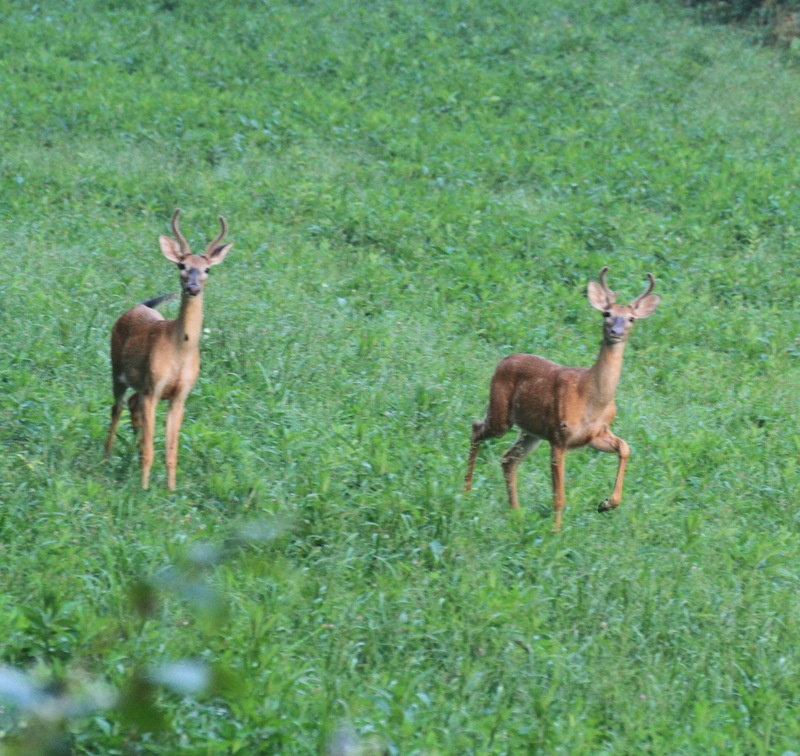 So I made an early dinner and asked Bill to join me and Chet on an evening hike down Dean’s Fork. I didn’t want to talk. I just wanted to see what was out there. It really was all I wanted, to go down Dean's Fork, for once, with a witness. The last time I'd had a witness with me was mid-June, when Phoebe and I had our incredible journey. I knew there would be powerful magic there this evening. It was my birthday! How could it not be magical? 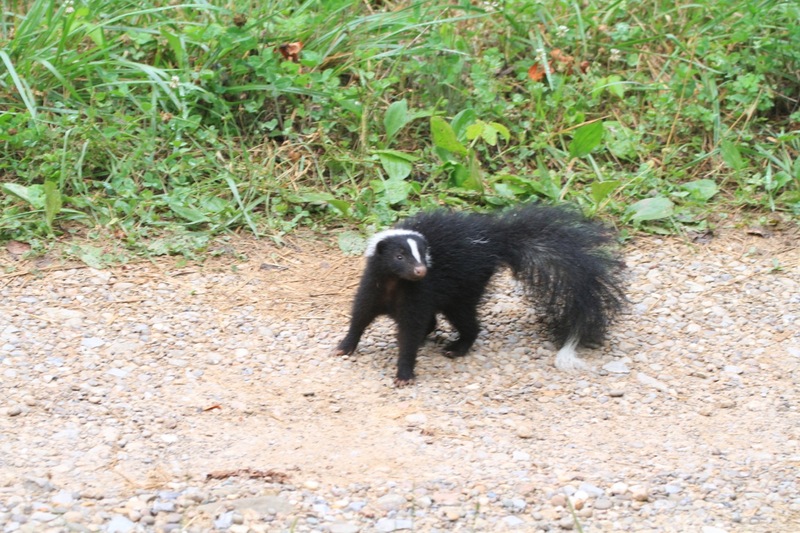 In a low voice, I said, “I’m thinking we’ll meet up with those skunks…” and no sooner had I said it than Bill said, “There’s an animal on the road ahead!” It was the little black skunk from my photo salon a week earlier. Its fur now dry, it was sleek and beautiful, showing a small white dash on its right flank and a long white tag ending its tail. 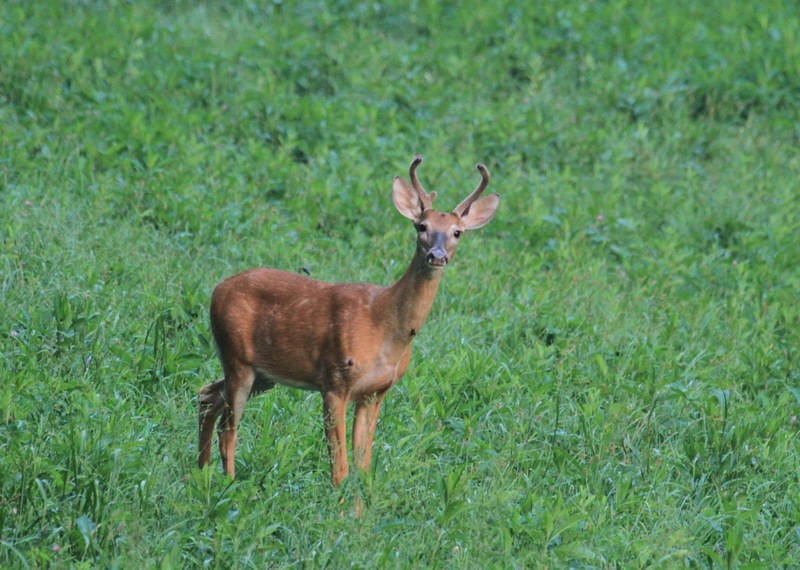 I hadn’t been able to see its pink toes when it was in the meadow! What a beautiful little thing! Thing was, it was trundling along at a good clip, and it was headed right for us. “We’ve got to get up on the bank. We have to get out of its way!” I hissed. So we clipped the leash on Chet and struggled up a vertical bank to wait for it to pass. The anticipation was delicious as it drew closer and closer. Would we get sprayed when it noticed us? It stopped abruptly, tested the air, then lunged up the bank to nab something. Errand over, it resumed its bumpity lope up the road. I was intrigued by the white tag end of its tail, seemingly an afterthought, the white hair being of a different texture and direction than the black. How cool! Still on it came. We hunkered low. It drew up on the road right below us, catching our scent, sniffing the air wildly, seeing us. Chet was tense and trembling, but not about to plunge down the bank. He’s acquired some wisdom in his good years on the earth. 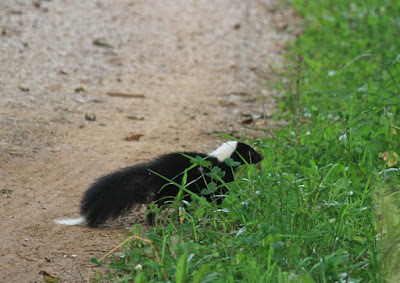 The skunk plunged into dense vegetation, headed down to what remains of the beaver pond. It would spend the early evening hunting frogs, and we would go on our way. Oh! It's YOU! Exit, stage right! What a gift, what a thrill, what a rush! Nothing like a good lil' skunk at close range. 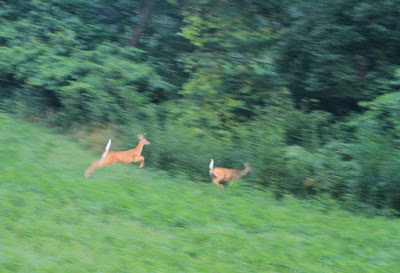 We hadn’t gone 200 more yards when we spotted a pair of whitetails fighting horseflies and grazing in the skunk meadow. That’s a nice piece of real estate, always has something to see. They were in constant motion, trying to keep giant horseflies from landing on them. The last thing they expected to encounter was people on this deserted road, so we had a leisurely look at them as they came on. 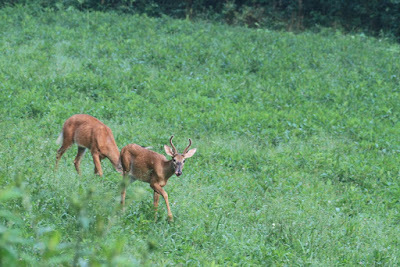 One has six points forming; the near one’s antlers look like a simple lyre. 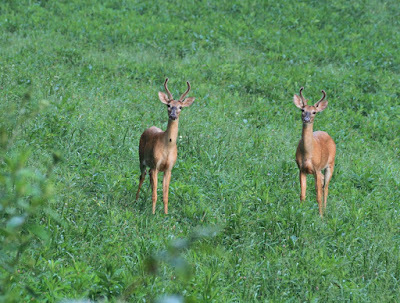 I’d guess these bucks were born last spring; that they’re in their second year. They’re thin and slab-sided; they have yet to develop the musculature of a mature buck. I’d also guess, from their striking similiarity, that they’re brothers, twins, and that they haven’t been apart for long since birth. 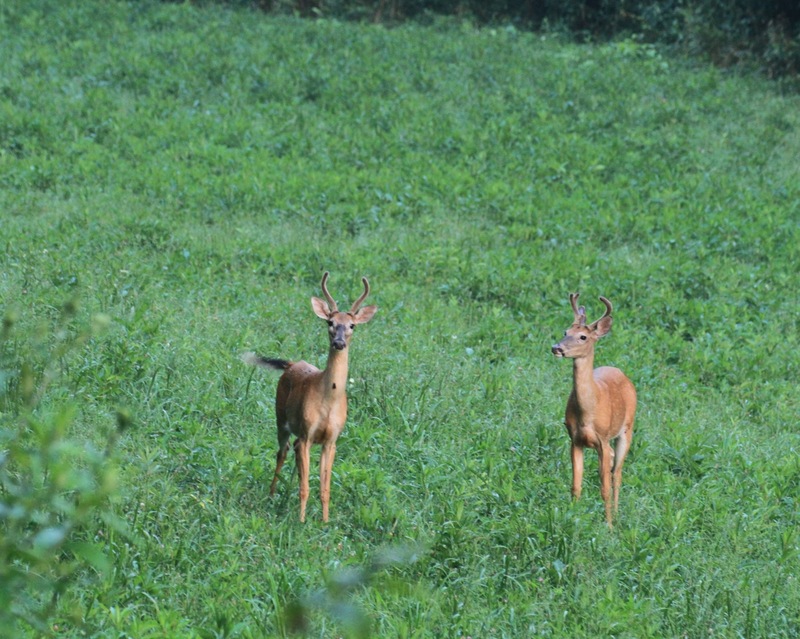 Testosterone ought to fix that...The wide pale rings around their eyes; the black face; the unmarked red brisket (lots of whitetails in our area have black briskets) all point to similar, if not identical, genetics. 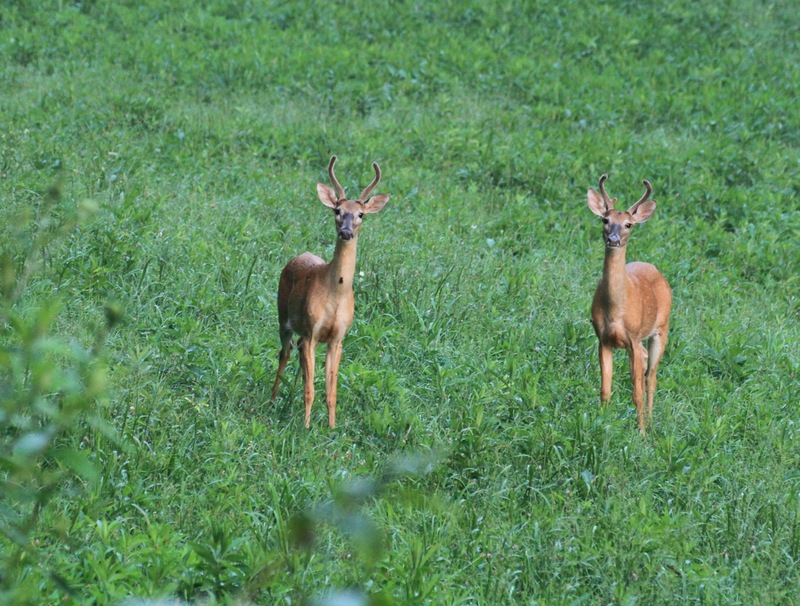 I found myself wondering if deer give birth to identical twins, and from there wondering if identical twin bucks necessarily develop identical antlers; clearly there were differences in their racks. I dunno...think they look alike in the face? Hee hee hee. It's fun to look for similarities in related deer. They're there, plain as day, if you look for them. I play the same game when people-watching at airports and shopping centers. 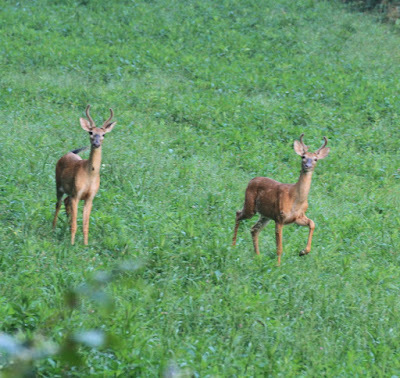 The lyre buck, on the left, figured out what we were long before the six-pointer did. He's already turned to flee while the six-point is still saying, "Duh?" 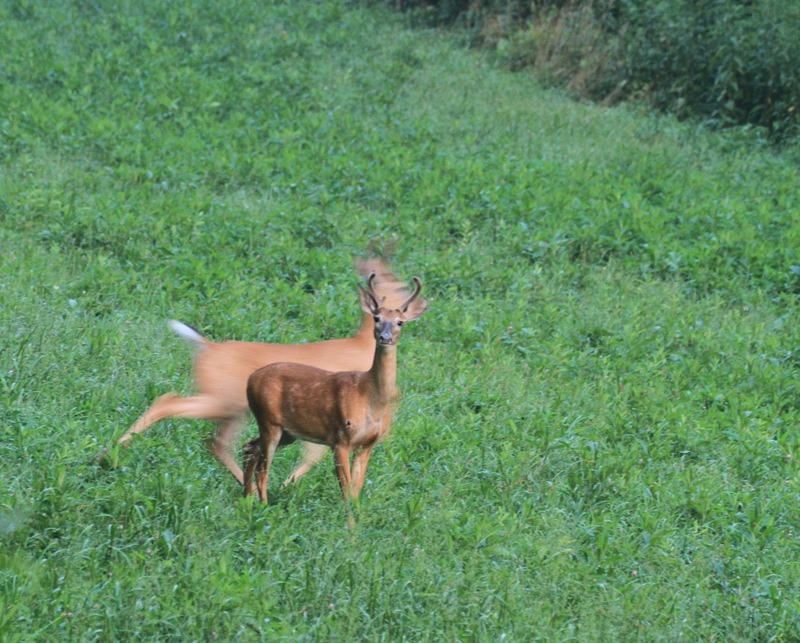 I like this shot, one brother a blur of motion and nascent wisdom; one frozen in ignorance. Still he stood, testing the air, wondering. We stood still, too, to drink in his beauty a bit longer. He has a huge horsefly on his lower neck and a tumor on his right shoulder. 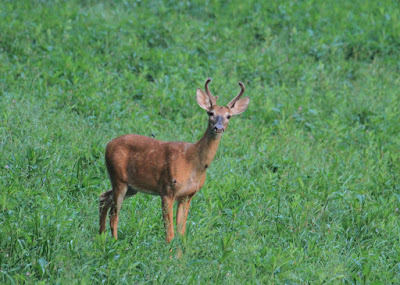 It's a cutaneous fibroma, a common tumor of deer, most often seen in younger bucks. Such tumors are probably caused by a papilloma virus, and they're contagious, but rarely adversely affect the animal, and tend to regress over time as the individual builds up resistance to the disease. Still, I don't like to see them, and I hoped he'd get over this without being disfigured; he's so lovely. It didn't slow him down any. 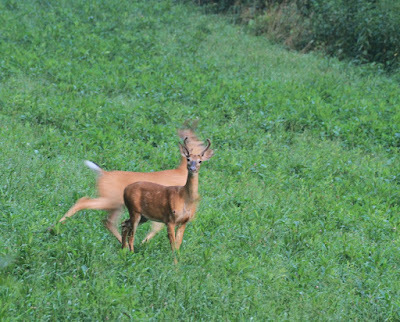 Bear in mind that this series of wildlife encounters happened on the evening of my birthday--the same day I chronicled in previous posts. 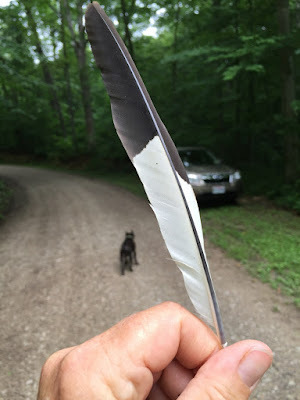 You know, beautiful birds and animals in the yard, garden gifts galore...having a birthday in late July in Appalachian Ohio is just the bomb. Especially if you're cheap like me, and enjoy free gifts. Dean's Fork always gives me things money could never buy. Here's what was waiting for me on another July lope. It had not been there when I set out two hours earlier. 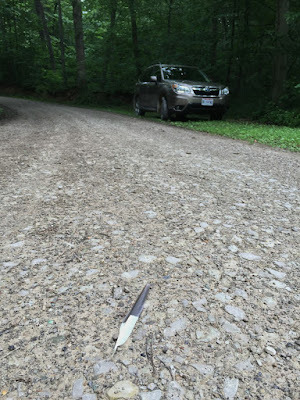 Yep, that's a pileated woodpecker primary, pointing right at my car. 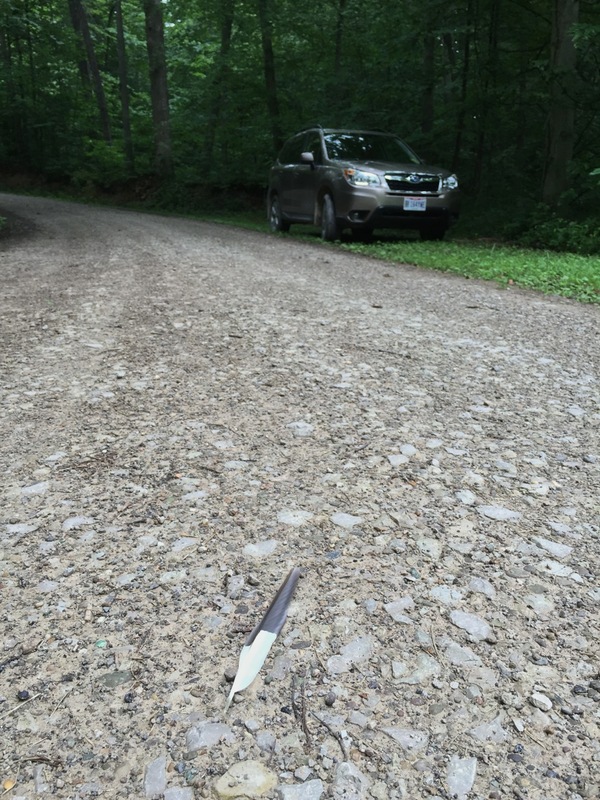 Thank you, Gods that Be, or whomever dropped this feather just where I would find it. I'm lookin' at you, Ida. But the sweetest birthday gift of them all was waiting for me about a mile down the road, just as it got dark. I'd been looking for Hannah for weeks, and never found her. I'd found her hoofprints in the dirt, so I knew she was around. And there she was. She walked up to us and let me love on her for a long time. 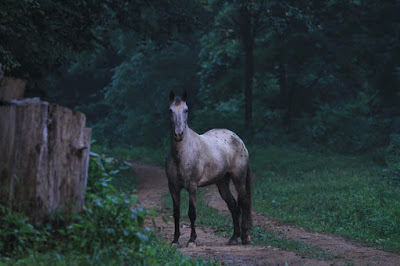 And she gave me this image, of her in the gloaming, self-contained and shining with health and contentment, one hind hoof cocked, as if she'd been standing there just waiting to wish me a happy birthday. And I believe she was. My favorite horse photo yet. My Hannah. Your birth day was replete with lovely gifts, true gifts that cannot be bought. Thanks for sharing, as always. What a delicious day. Better'n cake! I'll take that kinda birthday! That Hannah is a beauty. Well that certainly was a magical birthday. Does Hannah still have friend Rocky about? how great to see these beauties and to come across that gorgeous horse! At first I didn't think that horse photo was real! I thought it was a mystical screen saver or something. Remember screen savers? Anyway, Stunning. Happy birthday! My birthday is another wonderful time in Ohio-May 19. Though I've spent the last several in South Carolina. I absolutely love your blog and find it to be downright soul nourishing. Nothing more magical than finding feathers. What a fine one indeed! Glad your birthday was befitting the spirit you are! 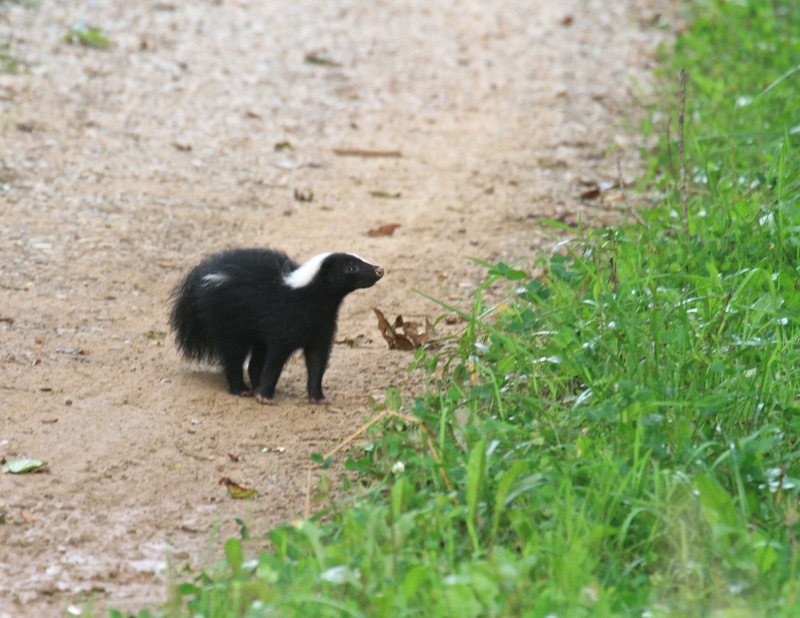 Julie, I love you photos and commentary of the skunks and deer but I love, love the photo of Hannah. In what you call, the "gloaming." Perfect word for that photo. That is a fav time of mine. It's when I get nostalgic that another day is passing but I also offer up thanks to God for the day that I had. It's really lovely.